One woman is fighting for her life and several others have been rescued after a large gas explosion in Irlam. Emergency services raced to the scene at Silver Street at 7.15am, where at least four houses were badly damaged. A 76-year-old woman has been rescued from the wreckage and taken to Wythenshawe Hospital with life-threatening injuries. Five adults and two children have also been rescued, and the search is continuing for others who could still be trapped. North West Ambulance Service say two people are still unaccounted for. Search and rescue teams specialising in working in the aftermath of earthquakes are at the blast site. The explosion was heard as far away as Chorlton, five miles away, and roof tiles were blown through the air. Silver Street, Merlin Road, Morrillion Road, Cutnook Lane and a number of other routes in the area are closed off while police and the other emergency services work at the scene. Search and rescue teams are combing the area around Merlin Road and Silver Street area in Irlam, Salford. One house has been completely destroyed and up to four others have been badly damaged in the blast, which happened at about 0700 GMT. One senior firefighter told BBC News he heard the blast six miles away. Greater Manchester Fire Service said a sniffer dog had indicated that further people could be trapped in the rubble. Earlier, five adults and two children were rescued by fire crews. One woman has life-threatening injuries and the others are believed to be seriously injured. “I heard an explosion from my own home at ten past seven this morning and I live in Urmston, approximately five or six miles away. 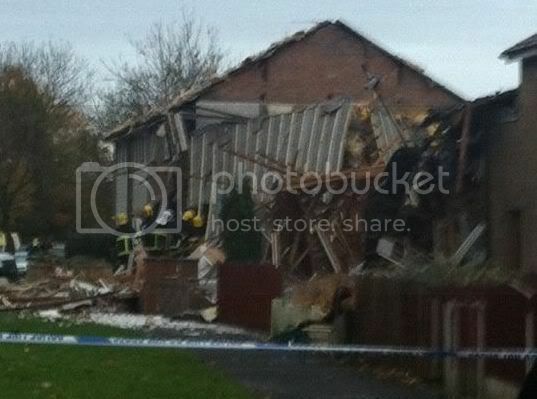 “About 10 minutes later control rang to say we had a report of gas explosion in Irlam. BBC reporter Kevin Fitzpatrick told Breakfast News roof tiles had been blown off and car windows smashed by the force of the blast. One man who lives nearby told the BBC: “It’s like a bomb’s gone off. All the roofs have gone, the houses are on the floor and there’s people in panic. He said there was “debris everywhere” and he had seen a number of people crying in the street. Greater Manchester Police are also at the scene and have closed Silver Street, Merlin Road, Morrillion Road, Cutnook Lane and a number of other routes. People are being advised to avoid the area.